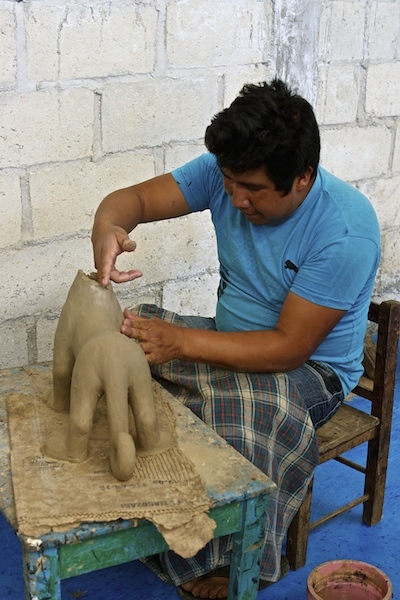 During my travels in Mexico I’ve always tried to meet local artisans wherever that may be. 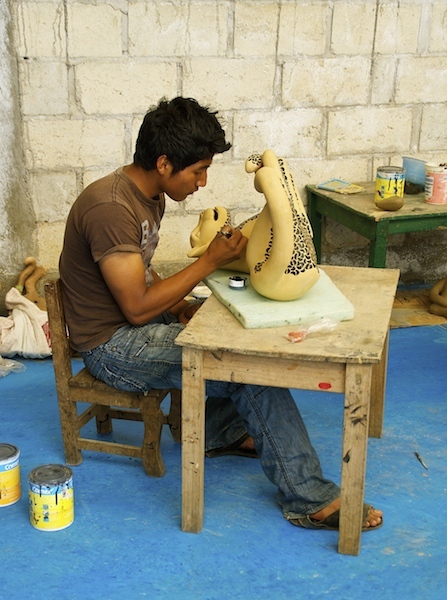 All the regions in Mexico are rich in handicrafts and usually “pueblos” in each region specialize in a particular art. Families keep the traditions alive by passing their knowledge and artistry to the younger generation. In my country many traditions were lost when the younger generation refused to follow in their family footsteps. I understand that many wanted a different life for themselves but at the same time I feel sorry for the loss of ancient artisanal crafts. That is why I am happy to still find it here in Mexico. I feel strongly that these local artisans should be supported and encouraged to continue. Some have managed to make a name for themselves and have their art recognized, even internationally. Some still struggle to make ends meet and are grateful for any visitor that takes time to hear their story, recognize their work and help them feed the family. 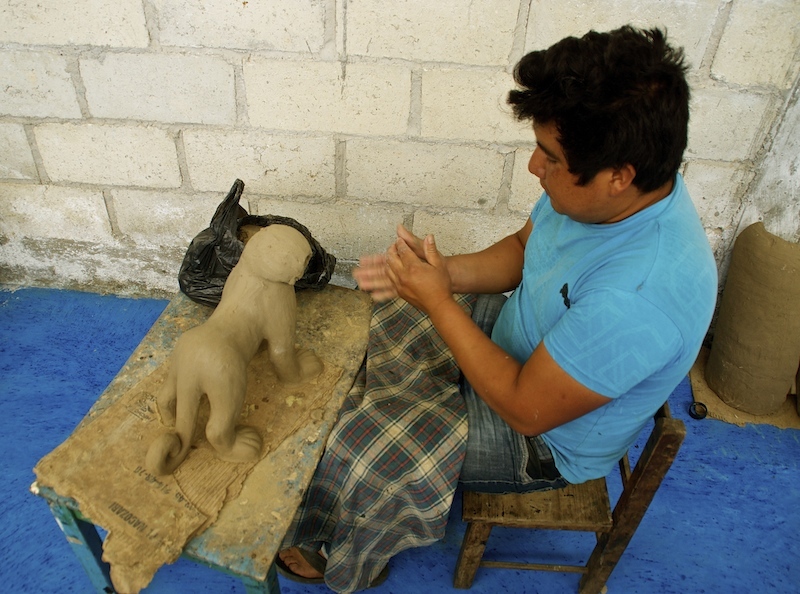 In Chiapas you find many examples of entire families dedicated to a specific craft. 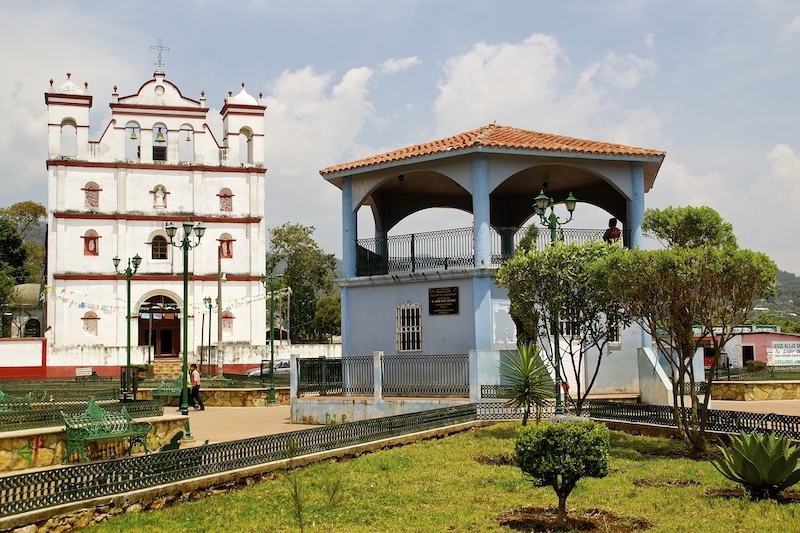 In search of these families we decided to go first to Amatenango del Valle, a “pueblo” known for its pottery. Here almost every family dedicates itself to mould flower pots and animal figures, like chickens, armadillos, iguanas and others. When an artisan called Alberto Bautista introduced the jaguar many other families followed his lead and jaguar figures started to dominate. The jaguar has been considered sacred since pre-hispanic times and was often represented in sculptures to symbolize deities and monarchs. The famous artisan Juana Gomez Ramirez was encouraged since her childhood to follow her family tradition. She took a special interest in the movements and facial expressions of the jaguars. Following the ancient techniques she perfected her art without ever using moulds. She always says that she just has to imagine how a jaguar would look right before attacking for example and she can reproduce it. 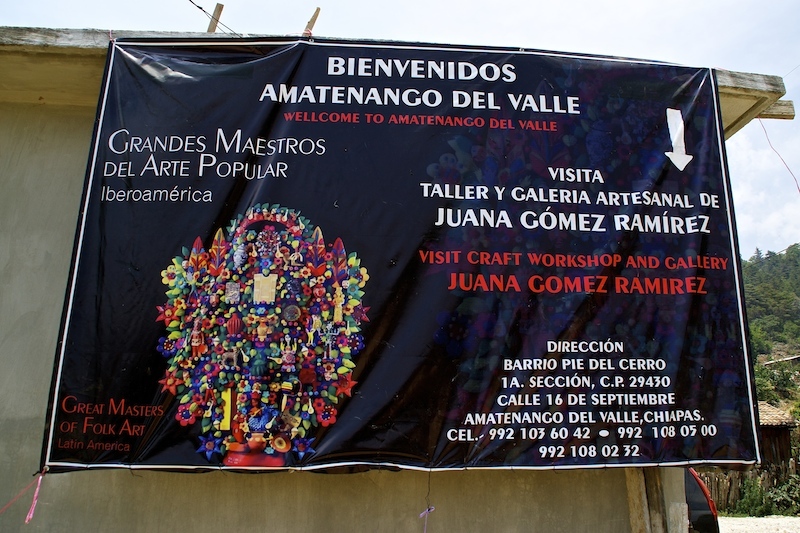 I had never heard of Juana Ramirez before but we were arriving in Amatenango del Valle when we came across this sign. This awoke my curiosity so we spontaneously decided to try and find the workshop. She was not there but one of her brothers welcomed us and explained her story, the family tradition and how all of her family devotes themselves now to creating jaguars in particular. We found them preparing a few new pieces. Her work has been internationally recognized thanks to Banamex, the second largest financial institution in Mexico. 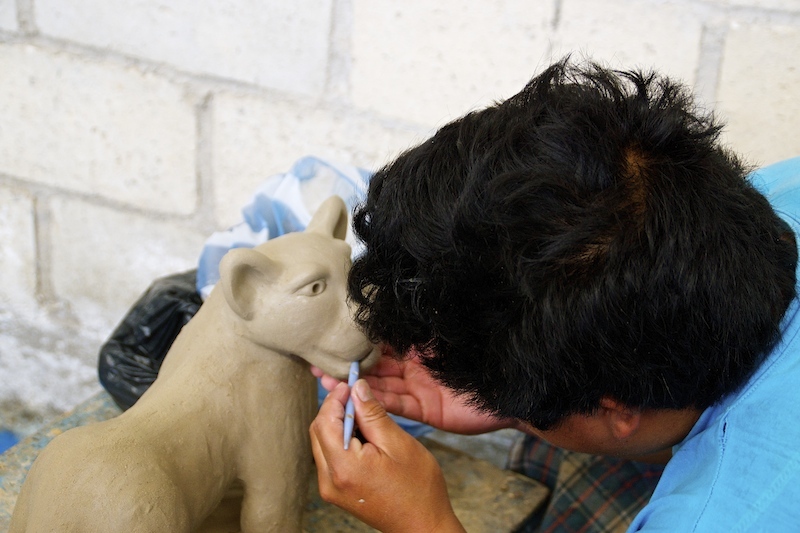 They have created a cultural forum which supports and promotes Mexican artisans and artists. Thanks to this forum her work has been promoted and some of her pieces have been exhibited in Spain and the US. Banamex has also become a good client, often ordering special pieces from her workshop. The family continues to put great emphasis on the quality of each piece. 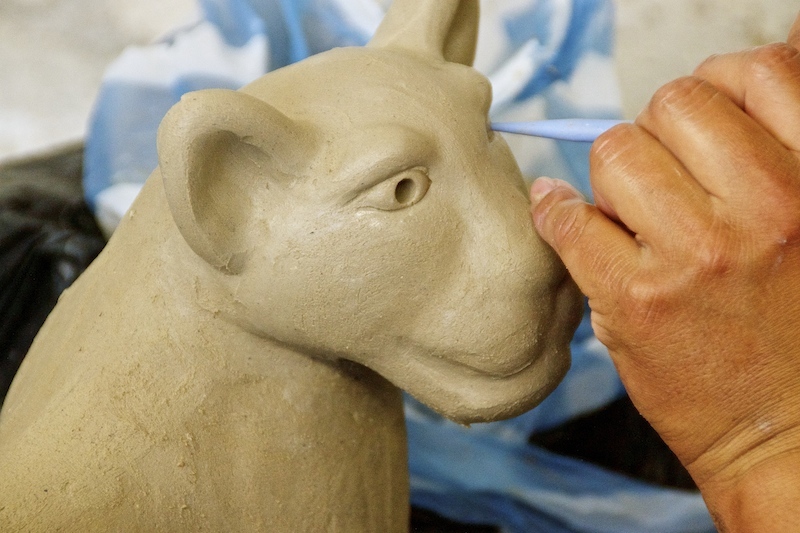 It was fascinating to observe how a jaguar piece comes to life. When we arrived the body had been shaped but there was no head yet. The brother showed us step by step how the jaguar is brought to life. When the piece is completed, it needs to dry entirely and then with a knife and a special spoon minor imperfections are corrected. 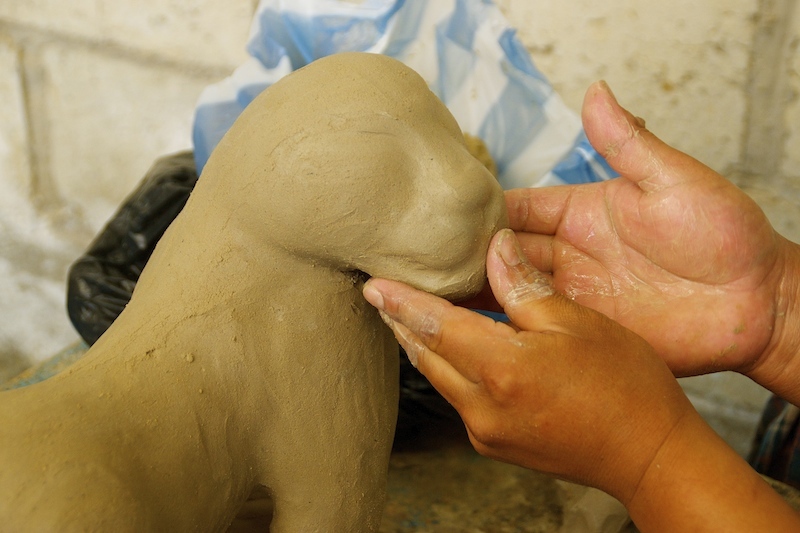 The piece is then polished with a stone and is ready to be baked. Most pieces are still baked in the open air like in pre-hispanic times. These are the ovens used. 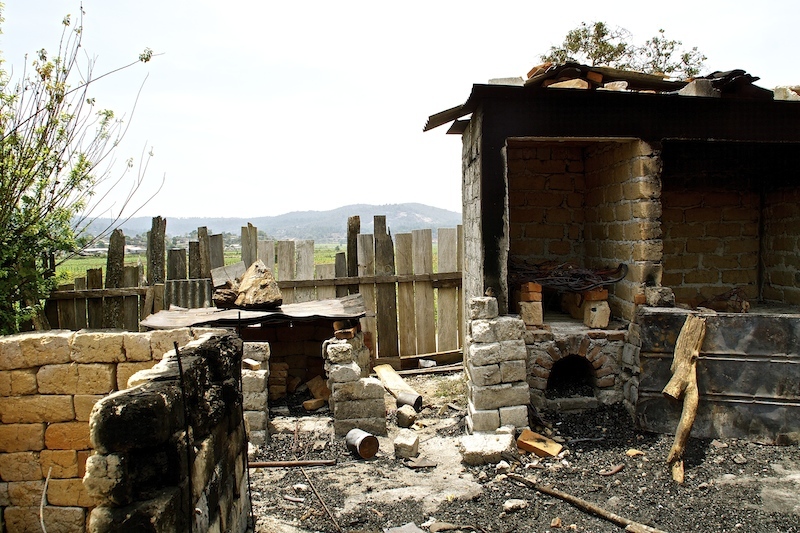 The pieces are placed on top of a layer of stones and firewood is put all around and then set alight. More firewood is then added until the pieces are almost covered. In general they are left to bake all morning. Juana’s pieces are incomparable because they are very natural. They are not varnished, the decoration is made with black paint over a cream natural base. 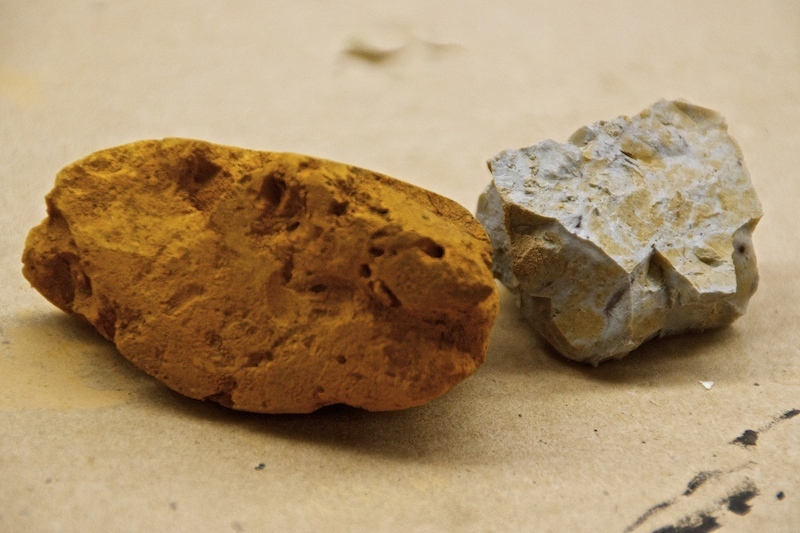 On the left you can see the natural soil pieces used to paint the base. On the right you have a piece of the clay used in this area. It was great to witness yet another traditional craft and see the new generation working with such care and pride. This is another wonderful part of what Mexico has to offer. Something worth exploring and discovering. Gracias yo, I’m very grateful for this amazing five years in this beautiful country. I fell in love with potter Margarita Diaz beautiful pottery.I would love to visit but my physical limitations prevent my visit. Please. someone do a video on her and the area. Photographers, make a book! 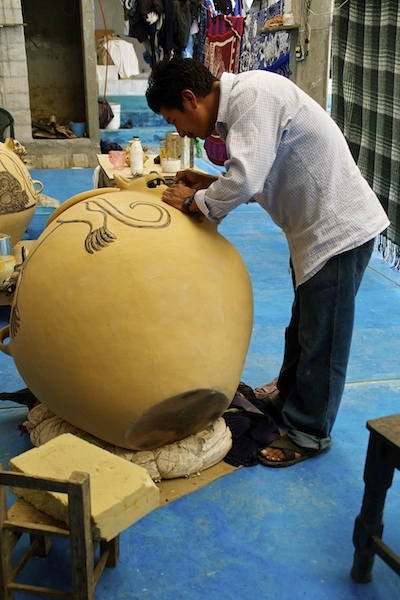 This is a talented area with weaving, pottery, and other artworks. Someone sponsor this village. Margarita Diaz is very respected and well known. Some of her work has been published in books already but traditional handicrafts of this level should always be encouraged.